So you’ve been in the backyard a lot andx you’re thinking it might be time to switch things up form your usual routine of bocce ball or ladder ball. That all sounds well and good but you don’t know what others games are out there for you to partake in. Well friends, we’re here to solve your problems. As active and fervent participants in all things backyard, we have played pretty much any game that involves fun, grass, and beer. This leads us to talking about one of our favourites, and a game that’s a staple in all our backyards: Beersbee. 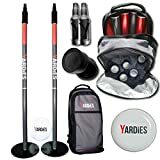 The Most Enjoyable Backyard Lawn Game? Beersbee! Now Beersbee is a fairly simple game, as most games that take place in the yard are. What makes it great is that like a lot of games, it’s completely accessible to everyone (you can find sets that aren’t specifically designed for drinking beers), and is fairly easy to compete in. There are a number of sets online that are quite affordable and will do the trick should you not be able to put together your own (which is also quite simple). Let’s take a look at a few of our favourites and why we think they should be in your backyard as soon as possible. What we have come to appreciate about this set is that it caters to all ages quite well. While the game has the word “beer” in the title, that shouldn’t mean that certain sets can’t be kid friendly. One of the other major bonuses we saw with this set is the fact that all the pieces come together and include a carrying case. The addition of a case is of great help when looking to take your set to the neighbours, camping, or two another third-party locale. Finally, the set is priced very fair and we can vouch for the quality. Don’t sleep on this set, as we believe it will provide backyard fun for years to come. We have used and reviewed Triumph Sports products before and have nothing but good things to say about their quality. 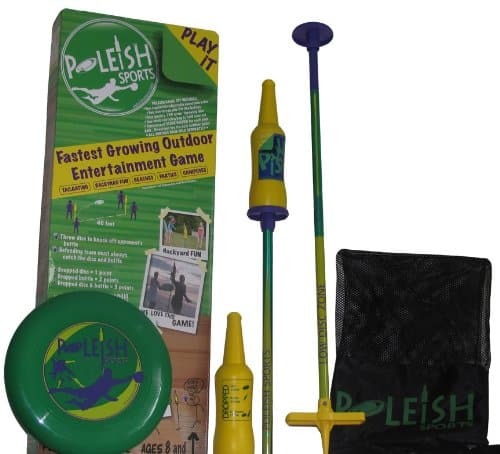 This set comes with all the pre-requisites for fun, and like the set from Poleish Sports comes equipped with everything you need. Also like the previous set, this comes with a handy carrying case and is built for everyone to play with. Priced at a very reasonable rate we will always recommend products from Triumph. The last set we chose to look at, the one above from SeaTurtle, really hit the mark. While the aesthetics scream summer, we appreciated the efforts to cater to everyone. How they achieved this is by providing the set with telescoping poles. 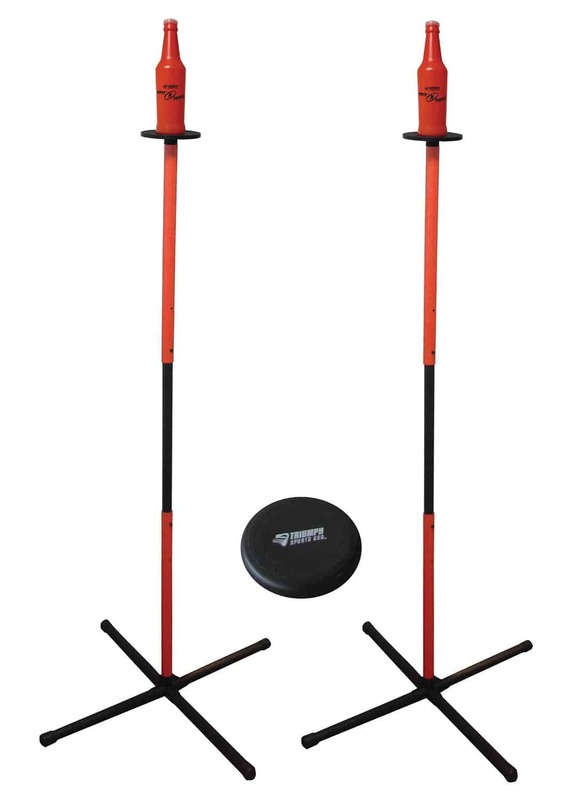 What this achieves is by being able to alter the height of the poles it makes the game a little easier for those who may have a tough time hitting the poles with regularity. Raise the poles up for the kids to give them a larger target to throw at and shrink them down for the seasoned and game-ready adults. The set comes with a carrying case as well as a 175-gram competition-quality disc. The SeaTurtle is best suited for grass and sand as the poles stick directly into the ground creating a more solid base. While a touch more expensive than the other two sets, we still believe it is worth the higher costs. The quality of the set and the disc will allow it to last longer and thus, enjoy more Beersbee. We’ve looked at a lot of sets and these are the three we have determined to be the best, and most affordable. What we look for is quality, simplicity, and transportability when choosing sets we think people will enjoy. We believe we have found three fine models here that will not only stand the test of time, but also allow people of all ages to participate. Backyard games are about bringing people together to share in the fun and have a few laughs. Beersbee is a great way to achieve this goal whether it includes beer or not.